A contractor’s right to complete work early was acknowledged by Courts in the 1960’s. Delayed early completion claims arose shortly thereafter and became somewhat common in the industry. 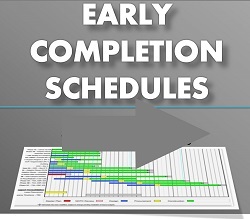 It was then, and remains now, a controversial issue in the construction industry with many project owners refusing to accept early completion baseline schedules. Others crafted contractual mechanisms defeat such claims. The purpose of this recorded presentation is to set forth the background concerning a contractor’s right to complete work early and examine the contractor’s right to seek an equitable adjustment should their early completion be delayed by action of the owner. Additionally, this recorded webinar provides a brief overview of 12 different ways owners can defend against claims oriented early completion schedules. This recorded webinar is a must if you’re a public or private owner, construction manager, contractor or design professional dealing with construction schedule reviews and early-completion schedule issues. Register now to gain key insights from our knowledgeable expert on this important topic. James is the former Executive Director of the Navigant Construction Forum and now serves as Senior Advisor of the Ankura Construction Forum. The Forum strives to be the construction industry’s resource for thought leadership and best practices on avoidance and resolution of construction project disputes globally. Formerly he was the Executive Director of Corporate Claims Management for Fluor Corporation, one of the world’s largest publicly owned engineering, procurement, construction and maintenance (EPCM) contractors working in the areas of energy, chemicals, infrastructure, manufacturing, life sciences and mining. Mr. Zack was previously Vice President of PinnacleOne and the Executive Director of the PinnacleOne Institute and a Senior Construction Claims Consultant for CH2M HILL, Inc. Mr. Zack has, for nearly 40 years, worked on both private and public projects. In the construction claims field, he is a recognized and published expert in mitigation, analysis and resolution or defense of construction claims and disputes.